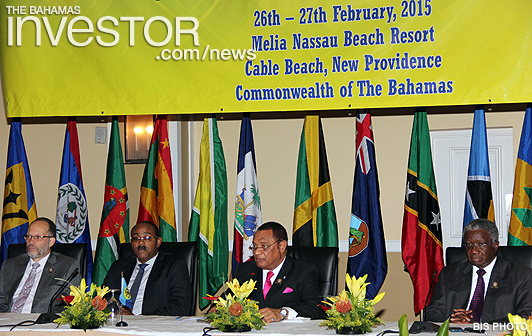 Chairman of CARICOM and Prime Minister of the Commonwealth of The Bahamas Perry Christie gave a summary statement at the closing of the 26th Inter-Sessional Meeting of the Conference of Heads of Government of the Caribbean Community (CARICOM) at Melia Nassau Beach Resort, February 27, 2015. We have had a most productive two days and decided on a number of issues. One of the key items related to the leverage of our human, natural and cultural assets for the benefit of our community. We agreed that emphasis should be placed on developing the cultural and creative industries and the sport sector in a manner that would benefit the economies and the society as a whole. Specifically we have agreed to create the necessary legislation to advance the creative industries and establish a sustainable financing mechanism for the sector in collaboration with the CARICOM Development Fund and the Caribbean Development Bank and the private sector. Looking at the realignment of the education system to accommodate our thrust in those areas and in that context the work of our Commission on Human Resource Development will be key. We have agreed on the composition of the Marijuana Commission, which we expect would soon begin its work to look into the social, economic, health and legal issues surrounding the use of marijuana and to consult with stakeholders to get a view on the issue. To improve implementation and overall governance of the community we approved the Functions of the Committee of Ambassadors. The committee will work closely with the organs and bodies of the community, the CARICOM Secretariat and the community institutions and associate institutions to establish and maintain an efficient system of consultations at the national and regional levels. It will also advance implementation, at the national level. Heads of government agreed to establish a Committee of Finance Ministers to work with the Caribbean Association of Banks to develop a plan to deal with our region being unjustly labeled a high-risk area for financial services. Because in many cases our indigenous banks cannot provide a high level of reward, correspondent banks are closing their relationships with them because of the claim that the Caribbean is a high-risk area for financial services. Unless this situation is addressed with urgency, the indigenous banks in each of our countries will be adversely affected in their operations. The meeting agreed to pursue the cause of reparatory justice through a process of engagement with the relevant countries. We exchanged views with Dr Jose Graziano da Silva, director-general of the Food and Agriculture Organization (FAO) and thanked him for the work being done in the region particularly with respect to Black Sigatoka disease and the increase in programme budget in the Caribbean. Hilton Worldwide and Resorts World Bimini have announced a new luxury lifestyle hotel in The Bahamas will fly the Hilton Hotels & Resorts flag. The newly-built luxury marina hotel, slated to have its official opening this summer, will operate as Hilton at Resorts World Bimini, and marks Hilton Worldwide’s second hotel in The Bahamas.